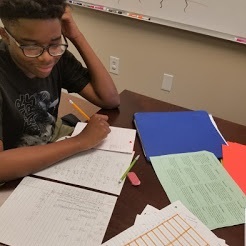 During a private tutoring session, one of my middle schoolers made a public service announcement: he's going to Harvard! This announcement was actually posed as a question initially. We were developing an approach for a math project when he asked if I thought he could get into Harvard. Usually, off-topic questions are tabled until the end of sessions since our time together is limited. One pitfall of being a business owner is the temptation to focus on the business and not on the people, to value outcomes over individuals. This time, the decision was easy. It was how the student posed the question that prompted me to shift gears from tutoring to coaching. He was apprehensive, hesitant... as if attending Harvard was this far fetched notion for a young black man from Mississippi. I can't say the student's mindset was surprising. There are so few opportunities for young people to learn about academic pioneers in the black community. The fruits of HBCU's (historically black colleges and universities), prominent civil rights activists, and sports icons are more widely acknowledged than Ivy League Black History and today's Ivy League Black Reality. I aim for two outcomes for each client - preK, K-12, adult populations, parents, and educators. I aim to help clients increase confidence and improve performance. My instinct, after hearing the way this student questioned the possibilities for his life, was to seize the opportunity to affirm his ability to not only attend, to graduate from Harvard University. In that moment, I decided that nurturing confidence in his ability to make this dream a reality weighed significantly more than making the grade in math. What's more, choosing the person over the outcome continues to pay dividends to this day. The student earned an A on the math project by following the plan that we developed together when he returned to school. More recently, he scored 110 as a science test grade on a chemistry unit project. There's no doubt his confidence is manifesting as out-of-the-box ideas and above-average execution of course requirements. We don't want his growth to stop here. During the holiday break, we're going to spend time researching the life stories of Black Harvard and Ivy League graduates from Mississippi and around the world. Between the lines of his innocent question lies an opening to making reading and research both relevant and meaningful. During my Character and Content training for educators, we emphasize the value of the words we choose. We discuss the importance of language, how the language of our self talk becomes our actions, how our questioning techniques influence student self talk. You're invited to schedule an in-person or virtual training; options for educators and parents available. Cultivating Grit: An approach to increasing confidence is a tool for exploring this concept as well. Learn more by visiting the website: je411.com/grit. The Year of Equanimity in Education?